Kitserver 8 is an add-on program for Pro Evolution Soccer 2009 (and Pro Evolution Soccer 2009 DEMO). It is a loader and manager for various modules. Select any quality settings (Low,Medium,High); various tweaks to graphics and game options: Any window resolution supported, hidden fullscreen resolutions unlocked; Manual/Automatic aspect ratio correction. LOD adjustment is available too. Change match time for Exhibition and Cup/League/ML/CL games. Then go to kitserver folder and run the setup.exe. What is new is that you can now also select your settings.exe. This is necessary because some changes are only possible in that file. simply select these both files (they should already be preselected) and click "Install". If you choose that you don't want to use Kitserver any longer, run setup.exe again and click "Remove". You can also install/remove Kitserver only for one exe by setting the other one to "no action". After installing Kitserver, if you run settings.exe from your game main folder, you are asked if you want to enable all quality levels. In PES2009, Konami doesn't allow you to choose a high quality level if the game thinks your PC isn't good enough for that. If you click on "Yes", that check is removed and you can try if they are right with their assumption. GDB is a collection of different types of game data. In the current release, those include: kits, faces and hair files. In the future, there will also be stadiums and possibly boots. The GDB is essentially a simple hierarchy of folders: the root folder itself MUST be named GDB, inside it there is a folder for kits: uni, (and in the future releases, folders for faces and hair: faces, stadiums, balls, etc.). You need to specify the folder that contains "GDB", not the "GDB" folder itself. In other words, if the full pathname is c:\mypesfiles\GDB", then the option must be: gdb.dir = "c:\mypesfiles\"
Kserv module is responsible for serving kits from the GDB ("Game content DataBase") during the game. The main feature of it is that you are not limited to the slots that cv06.img has for the kits, and you can assign a kit to any team. At the moment, it is not possible to have more than 2 kits, but in the future releases, you'll be able have a long list of alternative uniforms. You can see from map.txt above that in order to find a kit for team #21, the kitserver needs to go to the folder GDB\uni\National\Russia. This folder will contain all of the kits that are available to team #21. Inside it, you must create an individual folder for each kit. Like this: For players, 1st kit must have a folder name pa, 2nd - pb. Extra kits can have any folder names that start with letter "p". I found it useful to prefix all extra kits with px-. For example, px-redwhite. For the goalkeepers, 1st kit must be in the folder ga, 2nd - in the gb. Extra kits can have any folder names that start with letter "g". description Any notes about the kit. This text will be displayed on kit selection screen. Useful when there are several kits that look nearly identical, but you want to know which one is currently selected. any text in double quotes description = "All white (Euro 2008)"
In kitserver folder, there should be an img folder - if it's not there, create it, and then inside "img", create folders, as needed, named - cv00.img, cv01.img, cs0d.img, and so for. That's where you're going to be putting the BIN-files. By default, the AFS2FS module expects to find the img folder inside the kitserver folder. However, it is also possible to configure the location of "img" folder to be anywhere on your hard disk. This makes it easier to both manage your game content - you can keep the "GDB" and "img" folders away from the game/kitserver folders, and also makes for an easier upgrade of kitserver. This feature may be useful to people who like to play a tournament - a league or cup together. PES 2009 doesn't allow human players to control both teams, unless both of their selected teams are playing against each other in the match. With this new feature, you can remove that limitation. Now, even if it is for example, P1 vs. COM game, or P2 vs. COM - you can freely select which team you control with each controller. So, you can both play on the same team, or you can let your friend control the opposition - to make things more interesting. You can also now choose a "Spectator" mode for in tournaments. 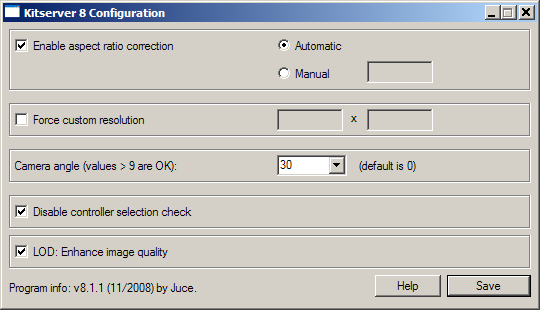 This release contains a first implementation of LOD adjustment tools for PES2009. For now, all you can do is basically check the checkbox that says: LOD: Enable image quality - what it does is disables the lowest LOD level, where the game uses low-poly models and low quality textures. This fixes the blurred faces problem, however it may affect the frame-rate, depending on the power of your videocard. Give it a try. For reasons known only to Konami product managers, for the second year running, they took away the interface feature that allowed to adjust camera angle (it was in PES3-PES6, but it disappeared starting with PES2008). The underlying logic is still present in the game executable though, and this module allows you to take advantage of it. You can adjust the camera angle: standard values are 0 - 9, but you can actually set a bigger value, which will result in camera turning even more. For example, i like to play with angle value set to 30.